Petswelcome.com / Articles / Does Your Dog Sleep Too Much? If you spend a lot of time with your dog(s), as we do at Petswelcome, one thing becomes very apparent: Dogs spend a ton of time sleeping. It made us wonder if that’s normal behavior or if it might indicate other issues such as boredom or depression, or even symptoms of possible ailments. After doing some research, we found that dogs do indeed sleep a lot—anywhere from 12 to 14 hours a day, depending on various factors, including age, breed and normal activity level. It turns out that older dogs and puppies sleep the most. With regard to breed, large dogs sleep more than smaller ones, while working dogs tend to stay awake for longer periods due their temperament and the jobs that they are assigned. And, just like humans, active dogs need more rest than those that are sedentary. With regard to sleeping patterns, dogs are very similar to humans. They move through five different stages of sleep, ending in REM (rapid eye movement) sleep; during this stage their eyes are closed but roll rapidly from side to side as they experience deep dreaming activity. The main difference between humans and canines is their sleep-wake cycles. People tend to sleep for a longer duration (7 to 9 hours), while dogs sleep in short intervals throughout the day for approximately sixteen minutes at a time. They also tend to wake easier because they are naturally more alert to the threat of potential predators. 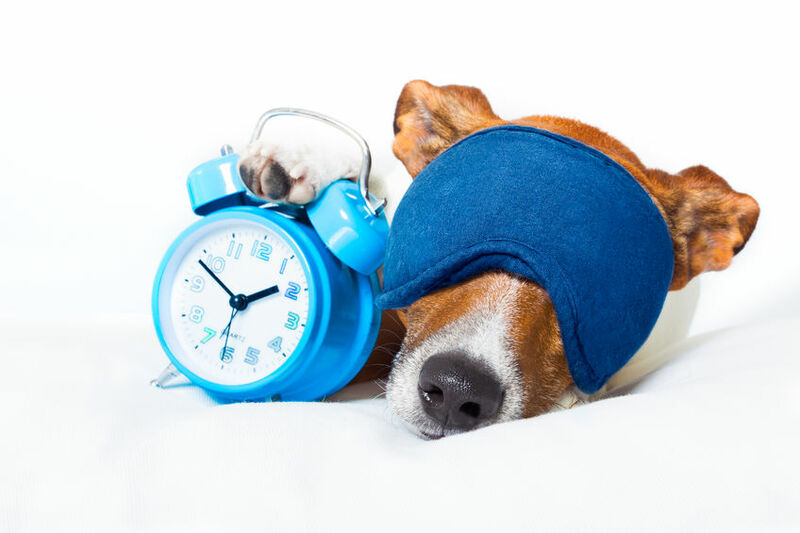 So how do you know if your dog is getting the right amount of sleep? First, if you notice a change in sleep pattern, or your pooch seems very sluggish and apathetic, it might be a sign that there is a larger problem, and you should get them to the vet for a check-up. A change in sleep pattern might also be a reaction to a change in the environment, such as the death of another pet or a member of the family being away for longer than usual. If your dog snores loudly, it could be that it’s just a loud snorer. However, it might also indicate that it is suffering from sleep apnea, a disorder in which breathing repeatedly stops and starts throughout the sleep cycle, preventing a restful sleep. Sleep apnea is most often found in obese dogs or brachycephalic (or pug-nosed) dogs such as English bulldogs. No matter what type of dog you have, exercise and play are critical to their getting enough sleep over the course of a day (and night). Some dogs, like sporting dogs or herding dogs, require more exercise, so if you have an area nearby where they can safely run off leash, make sure you get them there on a regular basis so you can be confident they’re getting the exercise they need. Also, playing with other dogs is a fantastic way to expend all that excess energy. Other factors that contribute to your pup getting enough sleep are having a comfortable sleeping place and establishing a regular and reliable routine of feeding, human interaction, and outside activities. 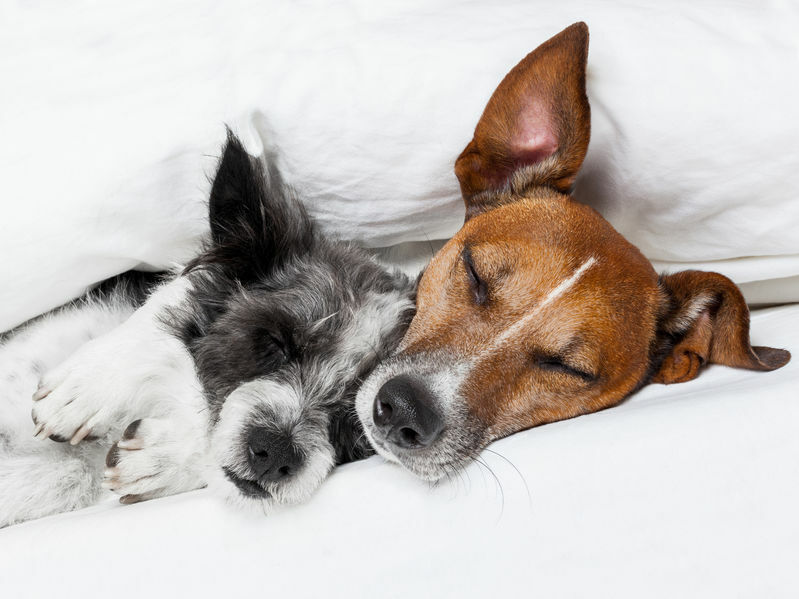 Dogs crave routine, so anything that upsets that routine will interfere with establishing good sleep habits, which are critical to your dog’s health, happiness and well-being.